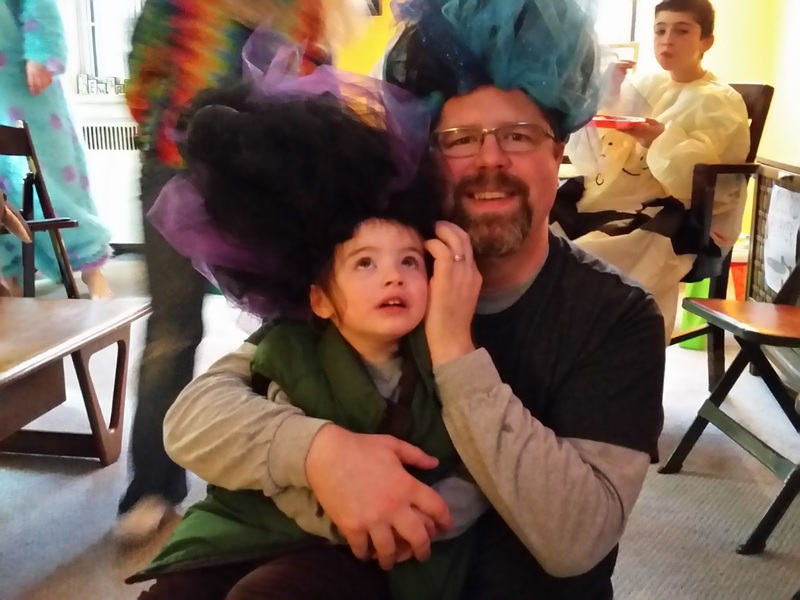 It is no secret that I love Halloween. 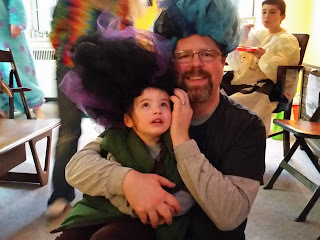 Always have, always will...and what I love about being a parent is that I can instill that same rabid loyalty to the excitement of Halloween in my children. This year I had Clara decide on her costume in the beginning of September - I need time to plan these things, people! All summer Clara had wanted to be Powerpuff girls. Clara, Freya and I would be the Powerpuff Girls and Gerald would be the villain, Mojo Jojo. 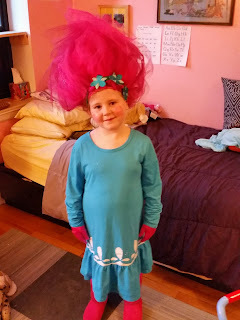 But in a surprise turnaround, Clara decided we would all be Trolls after watching and falling in love with the Trolls movie. Clara would be the heroine, Poppy Troll, Freya would be the Justin Timberlake Troll -Branch, and Gerald and I would be Background Trolls. 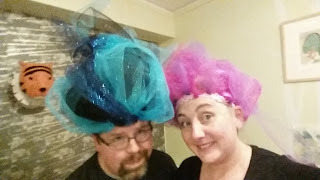 Over the weeks I began cobbling together their costumes, and took on the task of making the wigs because everything I could find for sale looked stupid and expensive. When October 1st rolled around, I surprised Clara with a Halloween Countdown Calendar which stoked the embers of excitement into flame. Freya even joined in practicing saying things like: "Happy Halloween!" 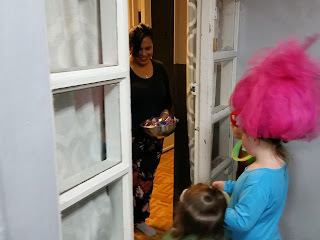 "Trick or Treat?" 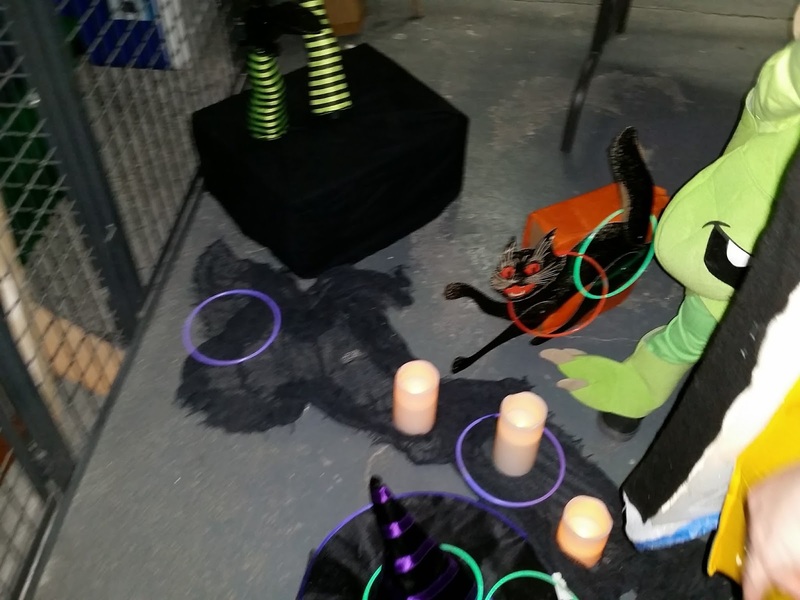 and "Hee hee hee, I'm a witch!" It was awesome. Finally the big day arrived - we were ready - and as usual - it's nearly impossible to get a family picture, especially one where Freya keeps her wig on - but here are the results of months of work. Freya is not pleased about the wig. 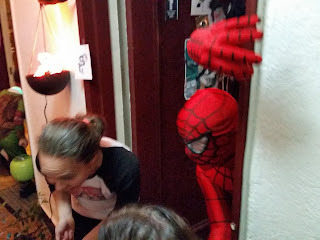 I host a Pre-Trick or Treating Halloween Party for the kids in our building. This year I went with a witch theme - I invented 2 games - throw gooey eyeballs into a witches cauldron, and the Witch's Gauntlet which involved throwing glow rings over obstacles - witches legs, a black cat,flickering candles, and a witch's hat. Both games were very popular. 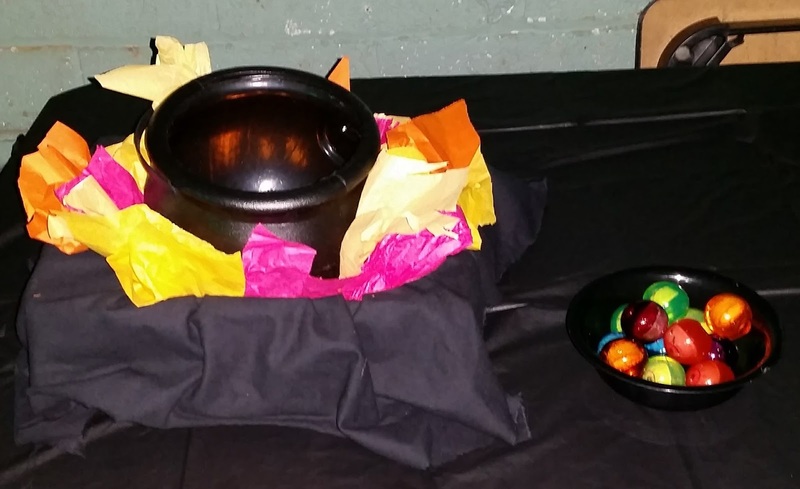 Cauldron, bowl of eyeballs on the side. Then it was time to Trick or Treat. Clara's friend Sara was there as well as their cousin Fred and his parents, Becky and Dustin. The only person I know who like Halloween more than me is my sister Becky - their family costume took it to a whole new level. 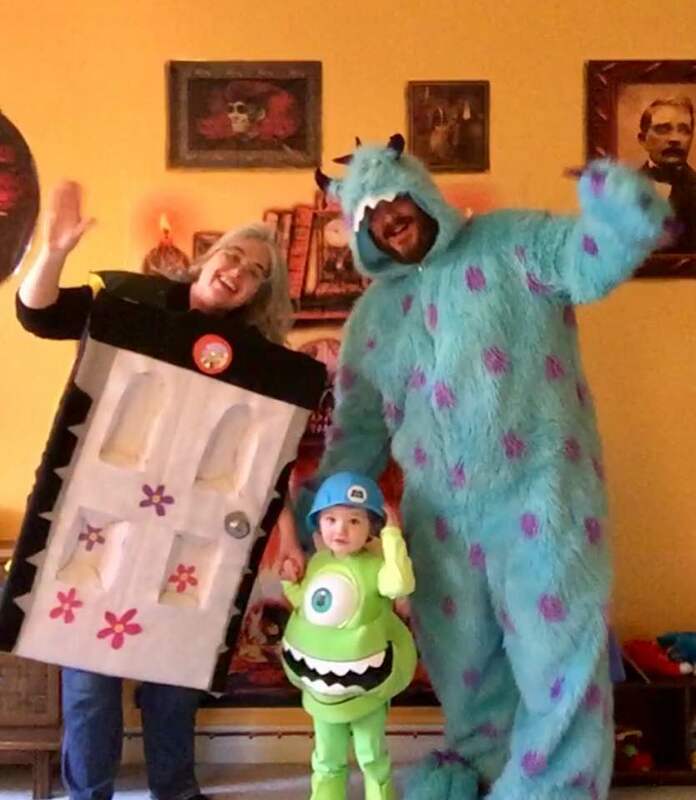 I present to you Fred as Mike Wazowski from Monster's Inc, Dustin as Sully, and Becky as Boo's Closet door. Come on People! As we tromped around the building knocking on doors, enthusiastic neighbors got into the spooky spirit. Babette chased us down because we missed her door. 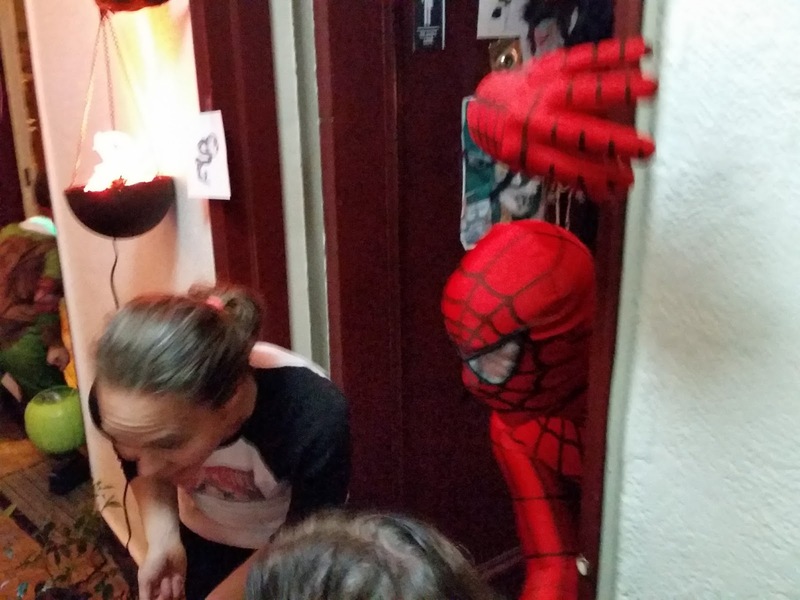 Trick- or - Spider Man! 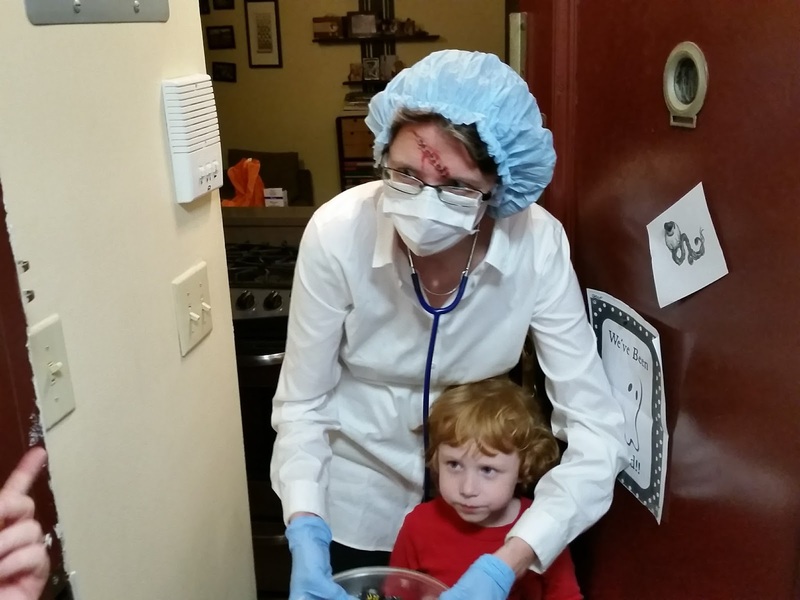 All in all it was another Halloween for the record books. Though I have notcied a pattern in Halloween costumes Freya may want to remedy next year...so far all three of her Halloween's Freya has been a sidekick to Clara's star attraction...and a boy. Year One: Clara - Princess Anna, Freya- Olaf. 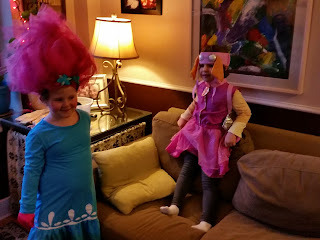 Year Three: Clara - Poppy Troll, Freya Branch Troll. What will next year bring? Only the ghosts and the goblins know. Poppy Troll and Sky From Paw Patrol. 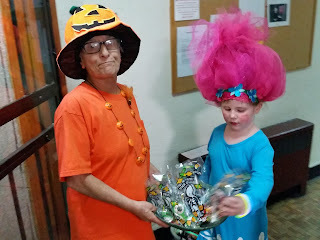 Freya and Fred get some candy. What a great post Jenny! 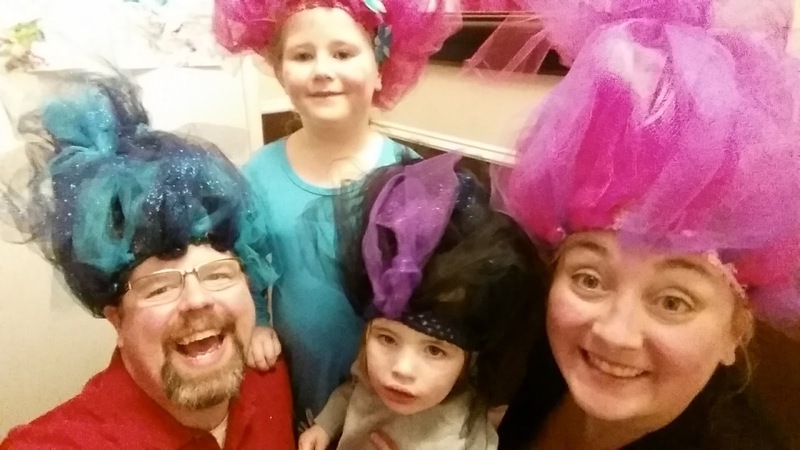 Looks like you are really taking on the traditions! How fun! 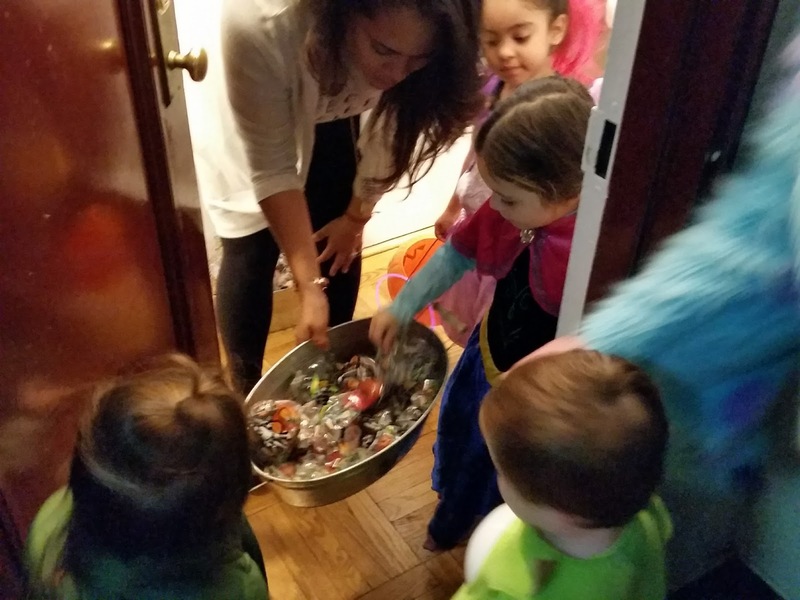 We went to a whole other neighborhood this year just so we could find some trick or treaters to hand candy out to! LOL! The costumes a great.